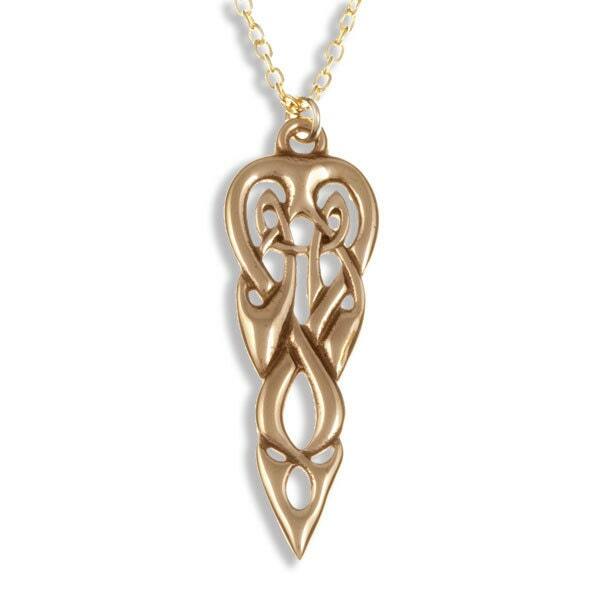 Bronze knotwork Merlins spear pendant on gold-plated trace chain. The earliest known references to King Arthur are associated with ancient Celtic mythology and so it is perhaps understandable that the name of Merlin was interwoven into Arthurian legend, and reflected the Celtic mystic beliefs. Merlin, also known as Myrddin and Merlinus, was often perceived as a wizard or magician. Amongst his powers he had the gift of clairvoyancy and foretold of King Arthur’s rule over England. Every item is handmade and therefore unique. SHIP FROM UK WITHIN 1-2 BUSINESS DAYS. UK ESTIMATED DELIVERY TIME- 2-5 BUSINESS DAYS. WORLDWIDE ESTIMATED DELIVERY TIME- 7-14 BUSINESS DAYS.